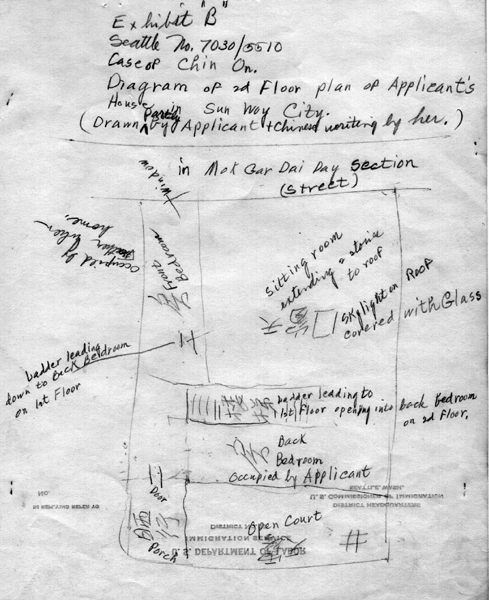 “Chin Jan Affidavit with photos of Chin Jan and Chin On,” 1933, Chinese Exclusion Act case files, RG 85, National Archives-Seattle, Chin On case file, Seattle Box 594, 7030/5510. This week’s blog entry is by Darby Li Po Price. He researched his family in the Chinese Exclusion Act case files at the National Archives-Seattle and found many family files. The following information is from a file on his great aunt, Chin On. It includes an affidavit and testimony by his great grandfather, Chin Jan; Chin On’s application for her certificate of identity and maps of the family home in China. 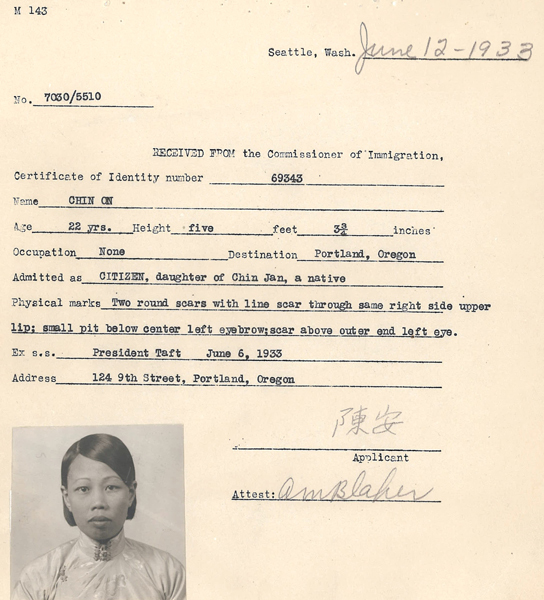 “Chin On Application for Certificate of Identity with photo,” 1933, Chinese Exclusion Act case files, RG 85, National Archives-Seattle, Chin On case file, Seattle Box 594, 7030/5510. 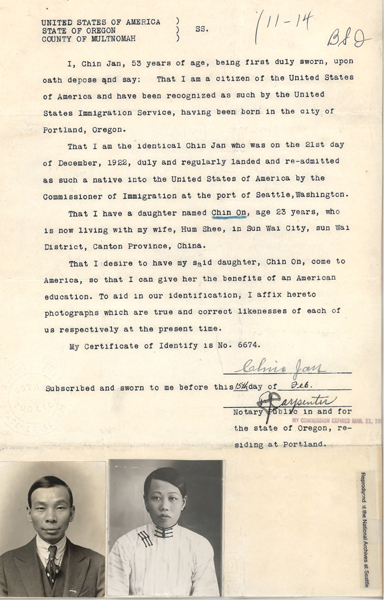 The 1933 immigration application and photos were submitted by Jan Chin (great grandfather) for his daughter On Chin. She was detained three days. 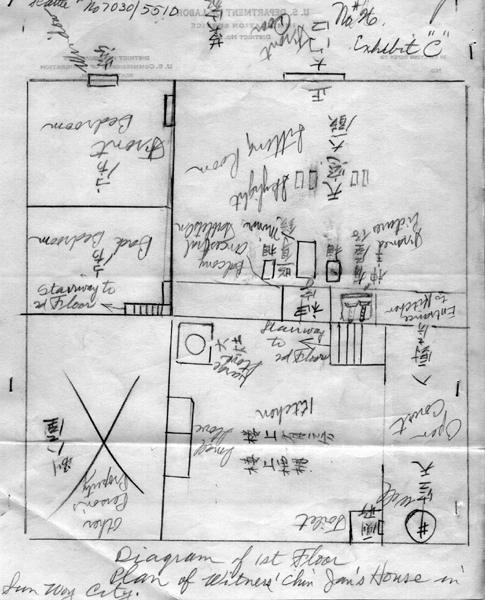 There are diagrams of their house in China which both drew as part of their interrogations. Jan had U.S. citizenship by native birth of immigrants. Such documents of Chinese women are rare compared to those of men. Even though the subject of the file may be a woman most of the interrogations and affidavits are usually by the men of the family. It is also nice to see Chin On and her family together. 1933 photos of Chin Jan, and daughter Chin On, age 22, for On’s application for admission to the US. Jan requested “to have my said daughter, Chin On, come to America, so that I can give her the benefits of an American education.” Chin On had written her father the year before to ask to come to America. On arrived in Seattle via President Taft June 6, 1933, and was placed in detention. The affidavit and application are accompanied by 30 pages of testimonies of On, Jan, and Jan’s sister Len Toy, drawings of their home in Sun Woy [Sun Wui], and detention release are in Seattle file no. 7030/5510. Interviews include extensive details on family members’ relations, lives, and homes in China and the U.S.
Jan, age 53, resided at 124 Ninth St., Portland, OR, and was a native U.S. citizen by birth from Joe Jew Chin and Dew Shee. Jan described his wife Hom Shee, age 47, and their sons in Sun Woy as Mon, age 30, Kway, 12, Wing, 7, Haw, 5; and Soon, 29, living in Chicago whose wife with their two sons lived in Sun Ning. Mon lived with his wife and two sons in another house. Mon was admitted to the U.S. in 1922; Soon in 1923. Len Toy was born in Portland, and spent a year and a half with the family in Sun Woy. Interviews were translated between English and Chinese. The Chins spoke See Yip dialect. There were discrepancies regarding existence or placement of: a house number above the front door, ladders, stairways, doors, windows, a mirror, an alarm clock, Jan’s pocket and wrist watches, where two of On’s brother’s slept, and where Len slept. On did not remember a prior house Jan said they moved from when On was 11. On said Jan’s mother’s name was Yee Shee, Jan said Leung Shee. On June 9, 1933 Roy Matterson, Chair of the Board of Special Inquiry concluded: “while there are a considerable number of discrepancies in the record that have not been cleared up, applicant testifies in a frank, unhesitating manner and seems to be testifying from facts and not from coached testimony and I am of the opinion that she has established her claim to being a daughter of CHIN JAN, and I therefore move to admit her to the United States as a citizen.” Admission was concurred by inspectors John Boyd and Earl Botts. 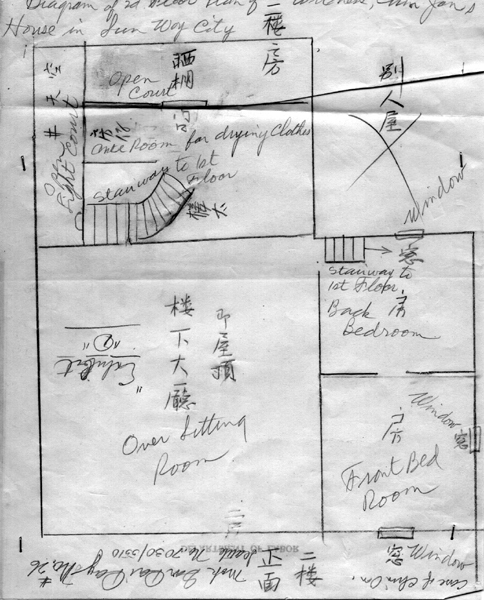 “Four house diagrams of house in Sun Woy City,” 1933, Chinese Exclusion Act case files, RG 85, National Archives-Seattle, Chin On case file, Seattle Box 594, 7030/5510. The Reference Sheet in Chin On’s case file contains the file numbers and names of her father, grandfather, three brothers, five uncles, an aunt, sister-in-law, two nephews, cousin, and a niece. Darby will be telling us more about his family in the coming weeks. 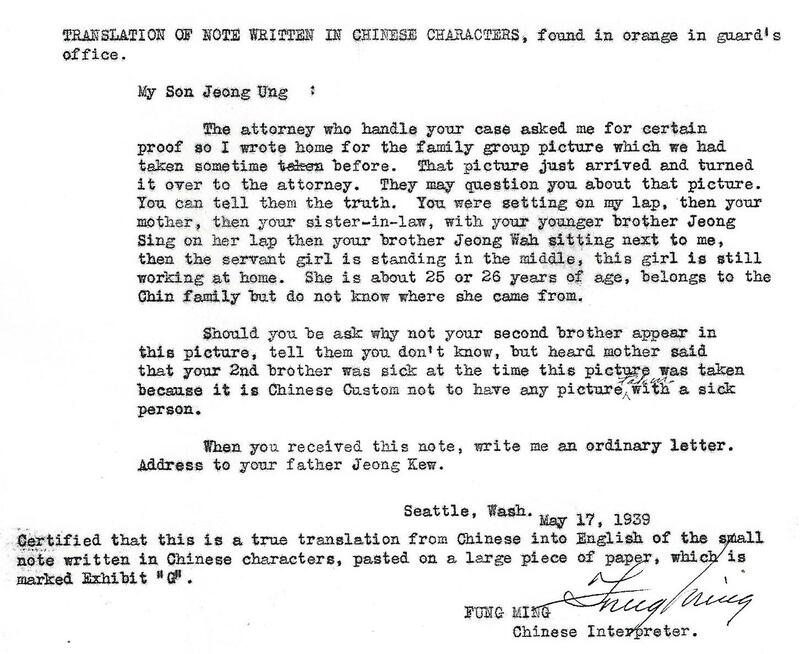 “Jeong Kew Family Portrait,” 1940, Chinese Exclusion Act case files, RG 85, National Archives-Seattle, Jeong Sing and Jeong Dong case files, Seattle Box 774, 7030/11576 & 11575. Jeong Sing and Jeong Dong arrived in Seattle on 17 October 1938. Their cases were denied, appealed and dismissed. They were deported on 4 August 1939. Their files contain two affidavits by acquaintances, two letters of recommendation, eight exhibits (maps, photographs, and letters) affidavits by Jeong Kew with photos of him and his sons, and information from three San Francisco files and two Seattle files. There are over 150 pages of interrogations. 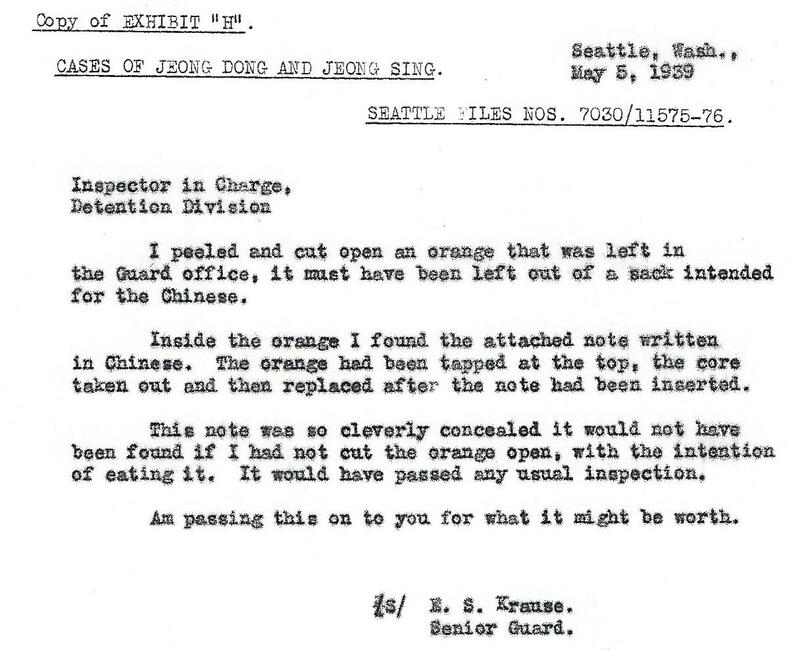 The most damming information in the file was a “coaching letter” written in Chinese that a guard found stuffed into an orange and left in the guard’s office. Many pages of the interrogations were devoted to discrepancies in witness statements, such as: who was the older of the two brothers, location of toilets in their village, if they had ever slept in the school house, if there was a servant girl staying in the family home, the number of rooms and outside windows in the school house, where the school was located, the material the family store was built from, where the applicants got their hair cut, when the applicants quit school, if there was a photo of their father hanging in the family home, and if their brother Jeong Wah smoked cigarettes. The coaching letter and the numerous discrepancies were enough to have Jeong Dong and Jeong Sing deported. 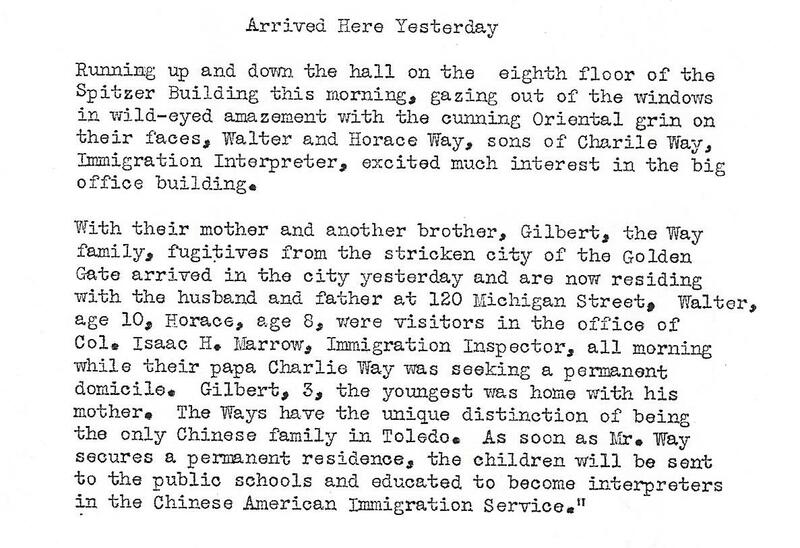 “Newspaper article, Dong Ah Lon,” 1940, Chinese Exclusion Act case files, RG 85, National Archives-Seattle, Dong Ah Lon case file, Seattle Box 766, 7030/11310. Dong Hong and Dong Yum attended Lee Lin’s wife’s funeral in 1937 and asked Lee if he wanted to remarry. They told him about their sister, Dong Ah Lon. Lee Lin had seven young children at home and was interested. Mr. L. M. Burr of Oakland Laundry Machinery Company wrote that Mr. Lee was a law abiding citizen who needs a mother for his seven small children. Adding that Lee’s wife had died the previous year and he was financially able to take a new wife. E. C. Alber, manager of Geo. W. Sneider & Co, funeral directors, stated that he had conducted the funeral services for Mah Shee Lee, the late wife of Lee Ling. Alber wrote that he had known Mr. Lee for over twenty years and that he was dependable and honest. Alber was of the opinion that Mr. Lee was well able to support a wife and needed one to take care of his home and family. He sent a copy of Mah Shee Lee’s 1937 death certificate with his letter. E. M. Pollock and Betton Rhodes, employed by the City of San Mateo, had known Mr. Lee Ling for fifteen years and vouched for his financial standing and fine character. George A. Kertell, a retired municipal judge and resident of San Mateo for forty-seven years, affirmed that Lee Ling was of good moral character and a successful business man. The file contains the attorney’s copy of testimony, death certificate of Mah Shee Lee (Mr. Lee’s wife), letters of reference of E.M. Pollock, B. Rhodes, E.C. Alber, and L.M. Burr; and San Francisco exclusion files for Dong Ah Lon’s brothers Dong Ball, Dong Yuen, Dong Hong, Dong Loon, and Dong Yum and her father Dong Toy. There are thirty more pages of testimony and analysis of the discrepancies in May and June 1939. In a letter dated 9 May 1939 to Dong Ah Lon from Lee Ling (Jung) he says, “I suppose that since you cannot come to my home, you wish to return to China; however, at this particular time, Sino-Japanese hostilities have made it impossible for you to return safely…” He had credit at the Yick Fung Co., in Seattle and suggested she try to obtain new clothes from them. He also sent her a money order for $20. Dong Ah Lon was not deported until 17 May 1940. There is nothing in her file from 9 November 1939 until 12 March 1940 when Marie A. Proctor, Seattle District Commissioner, wrote to Karl P. Heideman, Dong Ah Lon’s attorney, telling him that the funds for Dong’s maintenance would soon be exhausted and asking him to make a further deposit to cover at least sixty days at the rate of 95 cents per day. 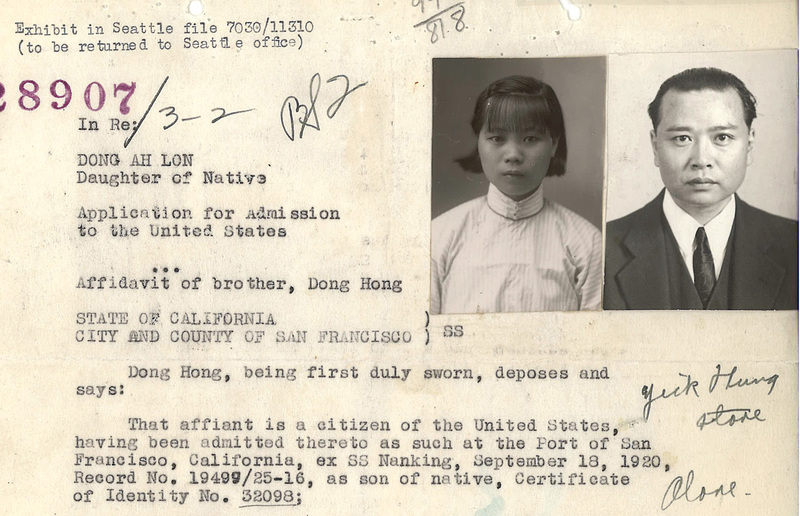 “Affidavit for Dong Ah Lon by Hong Dong,”1938, Chinese Exclusion Act case files, RG 85, National Archives-Seattle, Dong Ah Lon case file, Seattle Box 766, 7030/11310. Dong Ah Lon, age 21, arrived at the Port of Seattle on 9 August 1938 on the s.s. Princess Marguerite. She was born in Ping On village, Gee Kai, Hoy Ping, China and this was her first trip out of China. She was unable to establish beyond doubt her claim for entry to the U.S. as the daughter of U.S. citizen. When her father, Dong Toy, a native born U.S. citizen, was re-admitted to the United States in 1919 after a trip to China, he claimed he had a daughter named Lan Hai and with a different birth date than Dong Ah Lon’s date of birth. Dong Ah Lon could not recall ever being called Lan Hai. Her father had died in China in 1924 so he could not be asked about the discrepancy. The immigration inspectors were suspicious about her claim that Dong Hoy was her father. Dong Ah Lon’s brothers who were testifying in her behalf were Dong Hong, age 37, and Dong Ball, age 19. Dong Ah Long was 21. She only attended school for two years. She correctly identified photos of her father and brothers. According to her brothers she was the daughter of Dong Toy and his second wife, making Dong Hong her half-brother and Dong Ball her full brother. Dong Ah Lon seemed to be confused about the relationship. Her mother had told her she was the mother of all the children in her family. Her brothers did not agree with this. 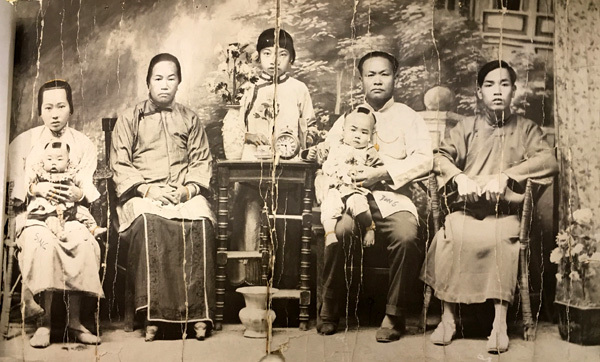 Dong Ah Lon’s application to enter the United States was denied 9 September 1938 because she could not correctly identify her closest neighbors in her village and her testimony did not agree with her brothers about their mother/stepmother. The Board could not find any family resemblance between the applicant and her two brothers and they were not satisfied that Dong Toy was actually her father. There were twenty-two pages of testimony from Dong Ah Lon and her brothers. Most of Dong Ah Lon’s description of the village agreed with her brothers except for the location of the toilets and the direction which the school faced. There were other minor differences. 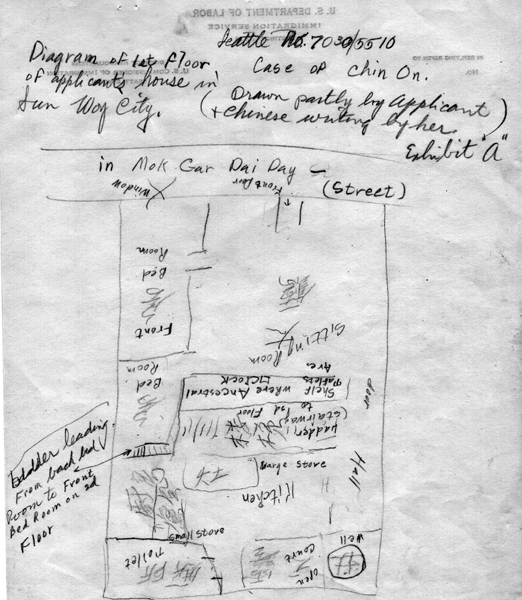 The interrogations in 1938 included the affidavit by Dong Hong with photos of him and his sister, Dong Ah Lon, and a map of Ping On village according to Dong Ah Lon. Dong Ah Lon was set to be deported in October 1938 but a petition for a writ of habeas corpus and an order to show cause were filed by her attorney, then an order for dismissal of petition for writ of habeas corpus and a petition for re-opening. Immigration decided to examine the oldest alleged brother, Dong Yum, and the prospective husband of the applicant, Lee Lin. These interviews took place in early 1939. Walter Jesse Way (Gee Chew Suey), son of Charles Way and Susie Tong Way, was born in San Francisco on 19 March 1896. He had just turned ten when the San Francisco earthquake and fire occurred in April 1906. His father, a Chinese Interpreter, had recently taken a job in Toledo, Ohio, and the rest of the family hadn’t yet had a chance to join him there. 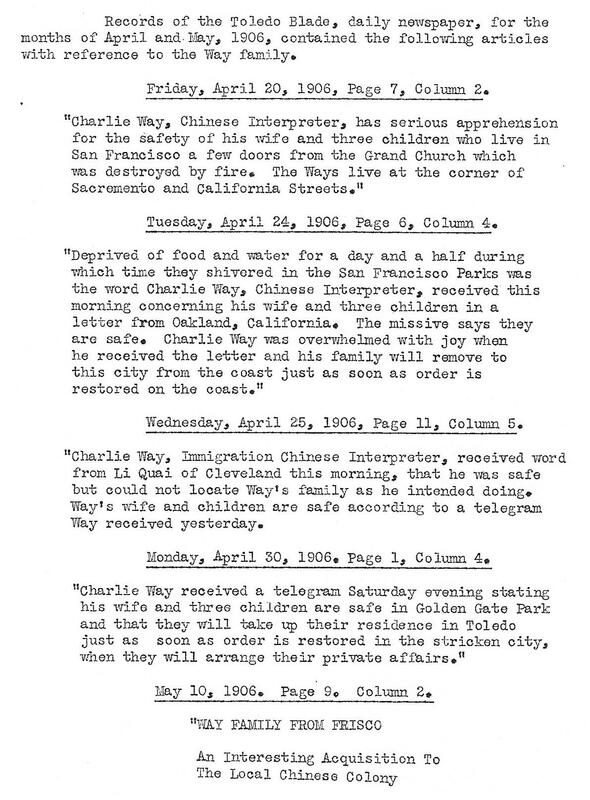 “Newspaper Articles on Charlie Way Family,” 1906, Chinese Exclusion Act case files, RG 85, National Archives-Seattle, Way Walter Jesse case file, Seattle Box 773, 7030/11561. Since Walter’s birth certificate was destroyed in the earthquake and fire, he wanted to establish his U.S. citizenship. In 1930 his parents swore in an affidavit that Walter was born in 19 March 1896 in San Francisco. Walter also presented his United States army discharge papers. He served from 18 September 1917 to 15 February 1919, part of the time in France; service number 1936275, Company C, 329th Infantry, 83rd Division. His discharge was recorded in the Lucas County Court House, Toledo, Ohio. The Immigration Inspector, John W. Hazard, reviewed a letter signed by Captain Robert F. Callaway of American Expeditionary Forces stating that Walter was entitled to wear a single war service chevron. Walter also had a letter from the Veteran’s Administration showing that his life insurance had been reinstated. Walter J. Way held various jobs until he started working for the Chrysler Corporation in 1926. In 1938 he was a technical statistician in the Experimental Department at Chrysler and living in Highland Park, Michigan with his wife, Ru Bee One. She was a singer and traveled with her job. Walter’s Form 430 was approved. The most current document in the file is a 1939 letter saying Walter Jesse Way had not yet traveled outside the United States.